Pick A Boo! - We're off! It started so well. I had yarn waiting in the perfect colour, picked which of the Boo Knits patterns I wanted to make first (Dragonfly Wings), and cast on. When I got to row 50 and stopped to check the stitch count I spotted a slubby bit of yarn right in the middle of a row that I would NEVER have been happy with... and so.... about 10 rows needed to come out. It's not the end of the world - I'm no stranger to false starts, and I'd rather do this than end up with something I don't love. This picture isn't quite up to date but gives you an idea of the colour. For this shawl I'm not adding beads. Partly because I don't have any and also because I don't think I'd wear a beaded shawl so much and this colour goes with much of my wardrobe and is likely to be well-used. I'm also doing a simple bar increase rather than a M1L/M1R. It wasn't a conscious decision, just something that happened (this was cast on while out and about so I wasn't really thinking much at all!) For the next one, I'll follow the pattern... probably. If you're blogging about the knitalong and would like to use this graphic, please right click and save it to upload to your blog. You may also like to leave a link to your blog post below. That's a gorgeous colour Sarah. I'll be casting on for the Dragonfly Wings very soon. I did have some sock yarn ear marked, but I'm off to Loop on Sunday. I may treat myself to something a bit more special. Lovely colour...now I have my yarn, I see yours is more red than mine. I've cast mine on, although everything has been set against me actually knitting since....apparently I'm gardening today! Really pleased to be part of this KAL...well done you on putting together, yet again, a brilliant project. I'm sorry only getting here now, had a total brain forget about checking in with everyone, wasn't much point anyone checking in with me on Thursday as I like you started and noticed one side of my tension just not sitting right and I doubted blocking would have fixed it so I frogged on Thursday and started again. Love the colour you chose and I think dragonfly wings will look amazing in it. 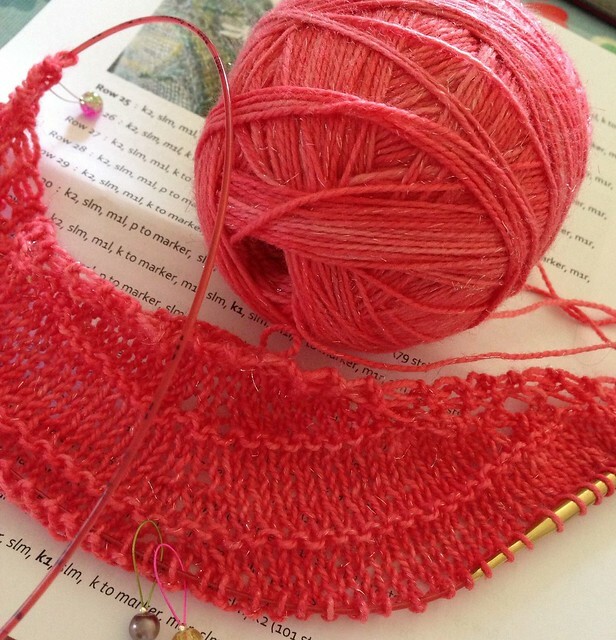 Thanks again for starting this I'm not sure I'd have worked up to joining in a kal for a shawl and I'm glad I have. That melon color is splendid. Hooray on having so many KAL!